BANGI, 7 Apr 2014 – Assisting the poor and those who are vulnerable should not just be the responsibility of the authorities only but should also be borne by the community as well. 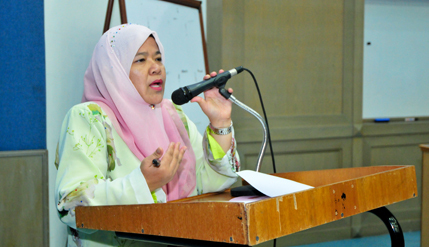 Deputy Dean of the Faculty of Education of The National University of Malaysia (UKM) Prof Dr Nor Aishah Buang said more volunteers are needed to help families and individuals who are vulnerable to various social and economic risks. Speaking at the launching of the Investing in those at Risk in Society (IRIS) programme organised by the faculty here recently, Prof Nor Aishah said collective action is needed to help reduce and manage those at risk. The IRIS social service flagship programme was launched by Dean of the Faculty Prof Dr Lilia Halim on behalf of the Vice-Chancellor Prof Datuk Dr Noor Azlan Ghazali. Head of the IRIS programme Assoc Prof Dr Mohd Aderi Che Noh was present. The programme is aimed at improving the welfare of the group at risk by teaching them various skills while also providing them with education. Those ‘at risk’ consists of the less fortunate, the marginalised and abandoned people who are not able to participate in the activities of the mainstream community, Prof Nor Aishah said. People in the at risk group can benefit from the services provided under the IRIS programme including those still schooling, their parents and single mothers. The services provided under the programme include educational coaching, subjects tutoring, vocational classes, spiritual guidance services, counseling, study rooms and career skills guidance. Prof Nor Aishah welcomes companies wishing to sponsor and contribute funds to finance the IRIS participants as part of their Corporate Social Responsibility (CSR) programme. Volunteers are welcomed to participate in the programme and will be given training and certificates for their efforts. Among the sponsors of the programme are Permodalan Nasional Berhad, Tenaga Nasional Berhad and welfare agencies such as Zakat Selangor and The Selangor Welfare Department and the Hulu Langat District office and its District Officer. Those needing more information about the IRIS programme, can call 03-89216231 or fax to 03-89254372. IRIS programme provides its service from 2.00 PM to 5.00 PM on weekdays and from 9.00 AM to 4.00 PM on Saturdays.